This is my last year in my 20s so I better make it a good year. I can't believe it really. Time just seemed to start floating by after 21. I still feel 21 at least! Not sure if that's a good thing or a bad thing lol. Anyway, it's time for another month of The Secret Recipe Club! This month I was assigned to Denise's blog, Eat Laugh Love. Yay, a new-to-me blog. She loves foodie mags and cookbooks like I do, and she has a culinary to-do list like me. She knows her food too. So many good recipes, like her Boozy Banana Bread and her fancy appetizers Cheddar Crisps with Roasted Grape Relish and Cranberry Pesto Bleu Cheese Crostini. What do you know? I chose a recipe involving caramel... shocker! You don't have to make your own caramel with this recipe... just use store-bought caramel topping! 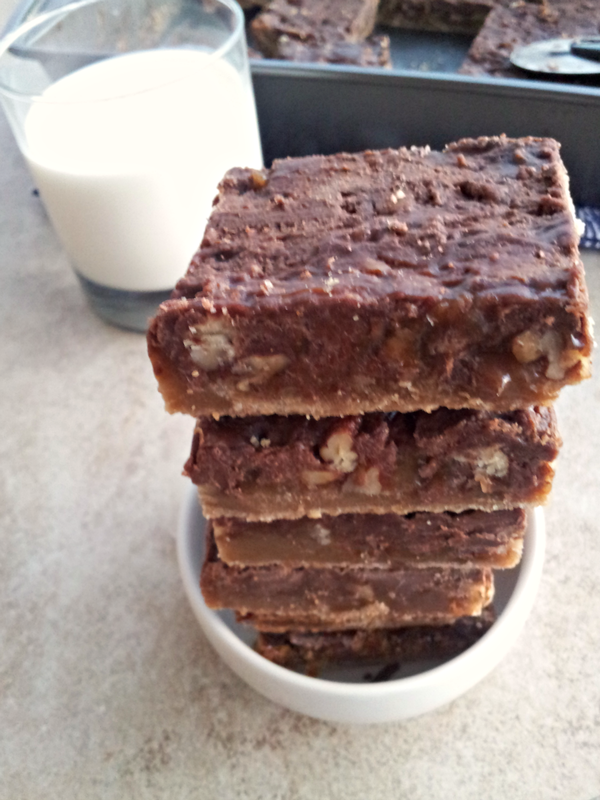 These caramel pecan bars aren't overly sweet, but they're rich, so cut into small bars like Denise advises. We cut ours into about 2 dozen small bars, I think Denise cut hers into 4 dozen small bars. Basically, you don't need a lot of these rich, gooey bars to hit that sweet spot. I did have some difficulty spreading the chocolate on after. While the chips did get softer and slightly melted, it was hard to spread it on as parts weren't soft enough. I still made it work though! I like the shortbread-like base, the crunch from the pecans, and of course the perfect combination of chocolate and caramel. See for yourself. Make em! In a large bowl, combine flour and brown sugar; cut in butter until crumbly. Press into an ungreased 13-in. x 9-in x 2-in. baking dish. Top with pecans. Drizzle caramel topping evenly over pecans. Bake at 350 degrees for 15-20 minutes or until caramel is bubbly. Place on a wire rack. Sprinkle with chocolate chips. Let stand for 5 minutes or until chocolate has melted slightly and is spreadable. Spread melted chocolate over caramel layer. Cool at room temperature for at least 6 hours or until chocolate is set. Want them to set faster? Place them in the fridge or freezer to harden and set faster. 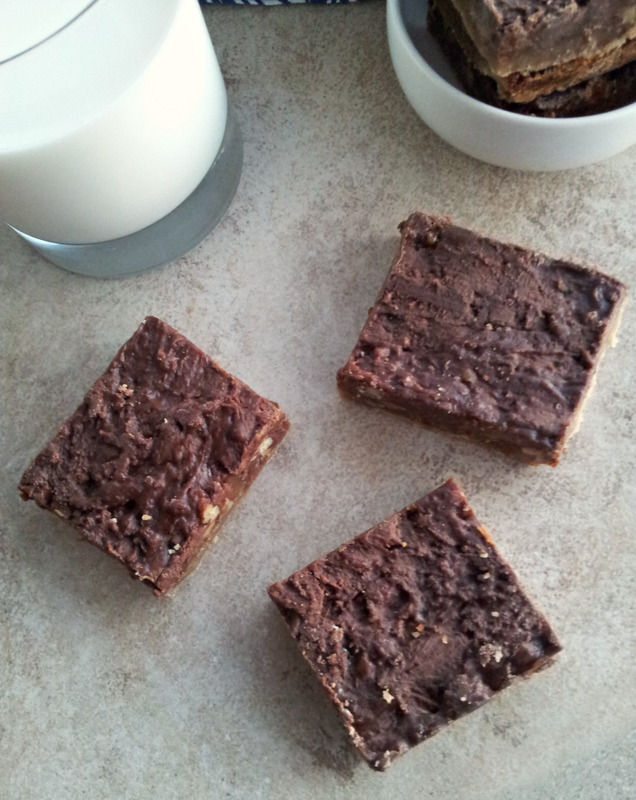 Cut into 2 dozen bars. 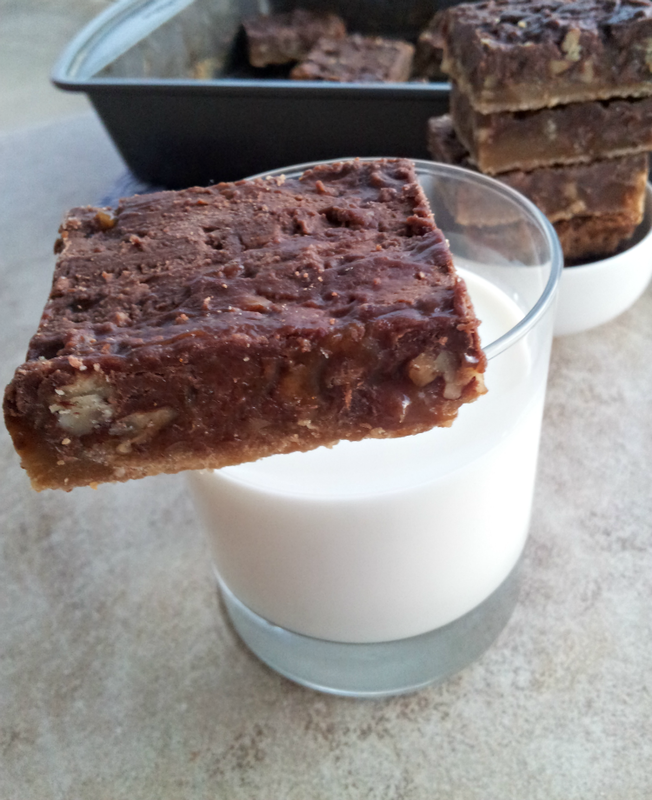 Check out my past Secret Recipe Club posts! *Photos taken on my Samsung Galaxy S2 phone. Time for my latest obsessions + confessions. Ready set go! Oh Ben & Jerry's, you sure know how to sucker a girl in! Salted Caramel Core Ice Cream? MUST FIND THIS. Are these not the most beautiful cupcakes you've ever seen? Veggies disguised as fries. I dig it. You don't have to go all the way to Philly for this pizza... you can make it at home. Thank you, cooking gods. Philly food, take 2. How about some Philly Cheese Steak Potato Skins? Done and done. Butterscotch Fluffernutter Krispy Bars. I love everything about you. You guys know about my love of macarons, right? Never tried one, but I love them all the same. They are just too dang cute! I just may have found the cutest macaron of all time though... Cookie Monster Macarons!!! I know, I'm dying too. DJ Tanner, Winnie Cooper, AND Nene Leakes all on DWTS. Yesssssssssssssss. Wanna know someone you should be following on instagram? GrandmaBetty33. It will make her day, and mine, and yours too. I love cute old people. Immediately started crying when I read this. I'm such a cryer! PJ's birthday was earlier this month. We celebrated allllll weekend long with good food and drinks. 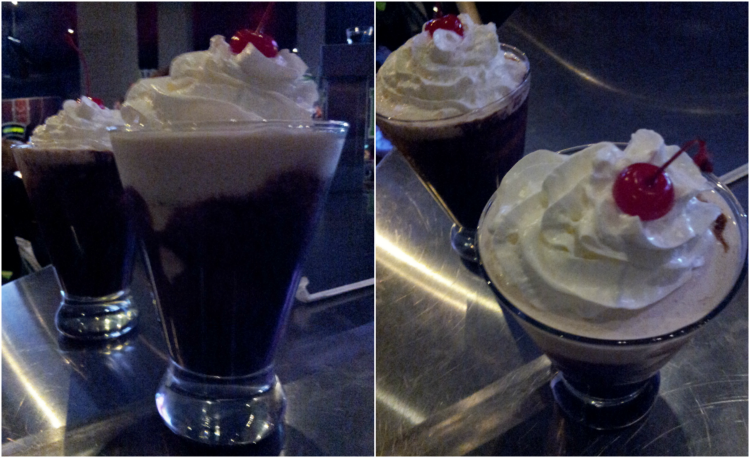 mmmm mudslides. 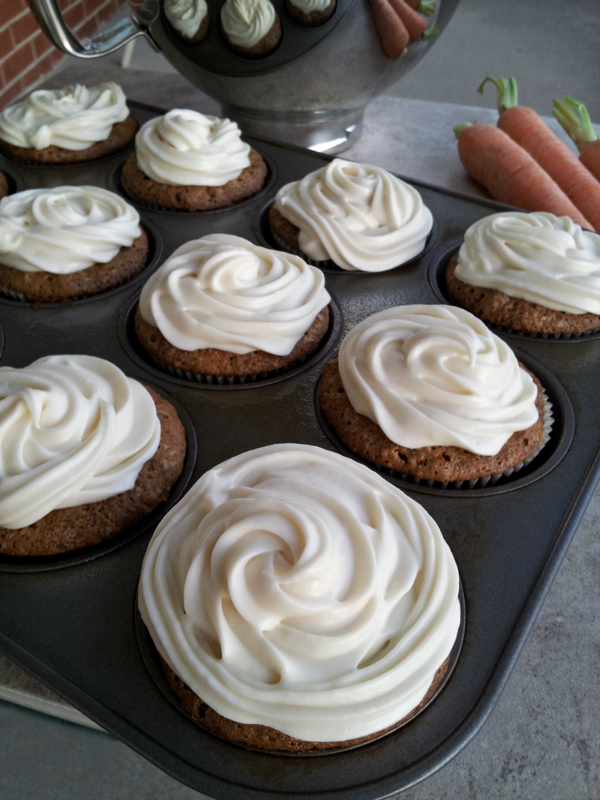 Oh and I also made him these delicious Carrot Cake Cupcakes with Cream Cheese Frosting. Because I'm a good fiance, and he's an even better fiance and deserves them and the world. Happy St. Patty's Day, friends! I'm spending St. Patty's Day at work, counseling clients, and in class. I'm not even wearing green! 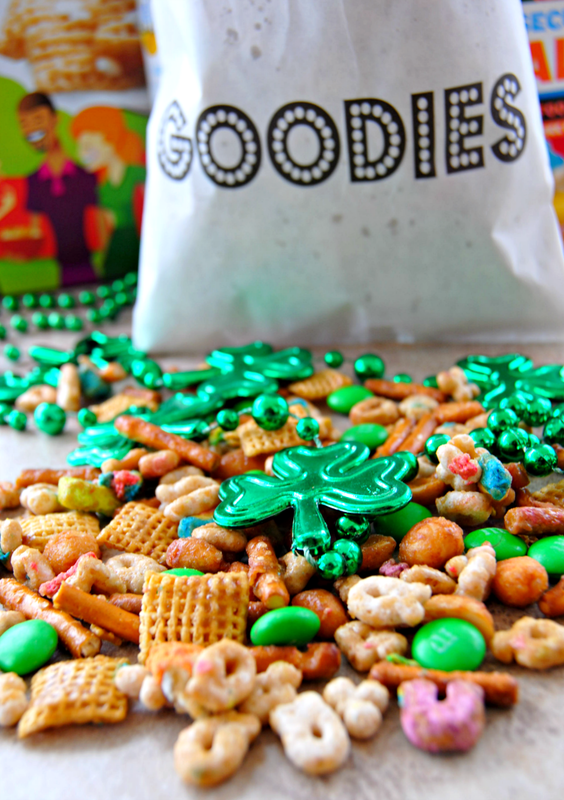 But I've brought you some St. Patty's Day Chex Mix as a snack to go with all that green beer. Don't you just love simple "recipes" that require no cooking, only the microwave? This chex mix snack is the perfect sweet and salty crunchy mix. In a large microwavable bowl, place cereals, pretzels and peanuts; set aside. In a bowl, microwave the brown sugar, butter and corn syrup uncovered on high for about 2 minutes, stirring after 1 minute, until melted and smooth. Pour over cereal mixture, stirring until evenly coated. Microwave uncovered on high 1 to 2 minutes, stirring and scraping bowl every 30 seconds, just until cereal begins to brown. Cool 5 minutes; stir in green M&Ms. Spread on waxed paper to cool. 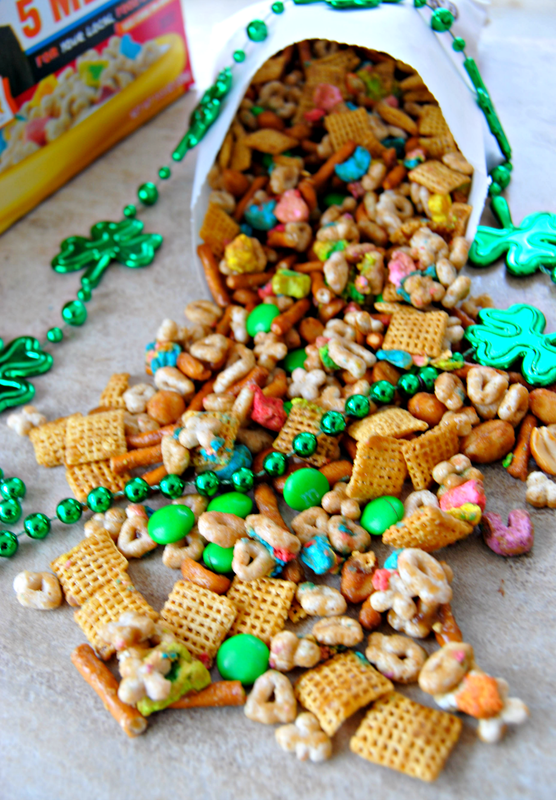 Place in gold foil baking cups to make them Pot O' Gold Chex Mix cups, if desired. Store in airtight container. *Side note: Have you ever seen the Cap'N Crunch Oops! All Berries cereal? Can someone just make the Oops! All Lucky Charms Marshmallows cereal? 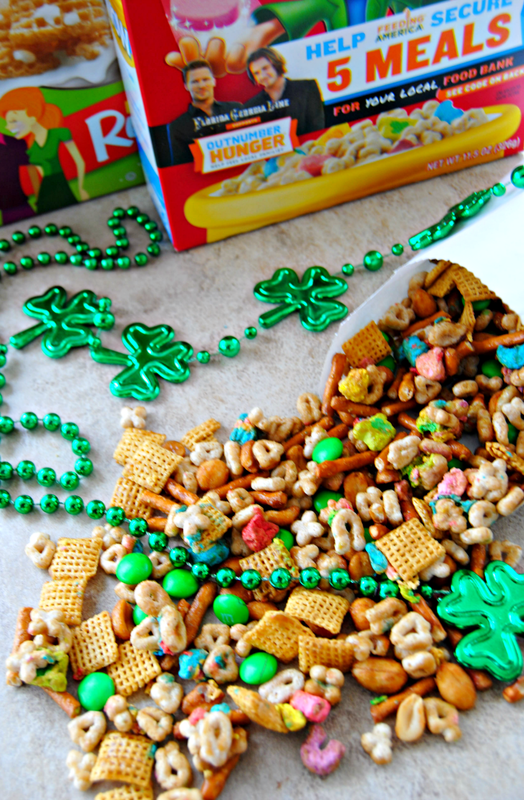 Because let's be honest, no one cares about the healthy cheerio-like cereal bits in Lucky Charms. And by no one, I mean me. Sorry if you do. I assume everyone eats like a 5-year old, like me. Give me all the colored marshmallows!!!!!!!!!!!!!!! 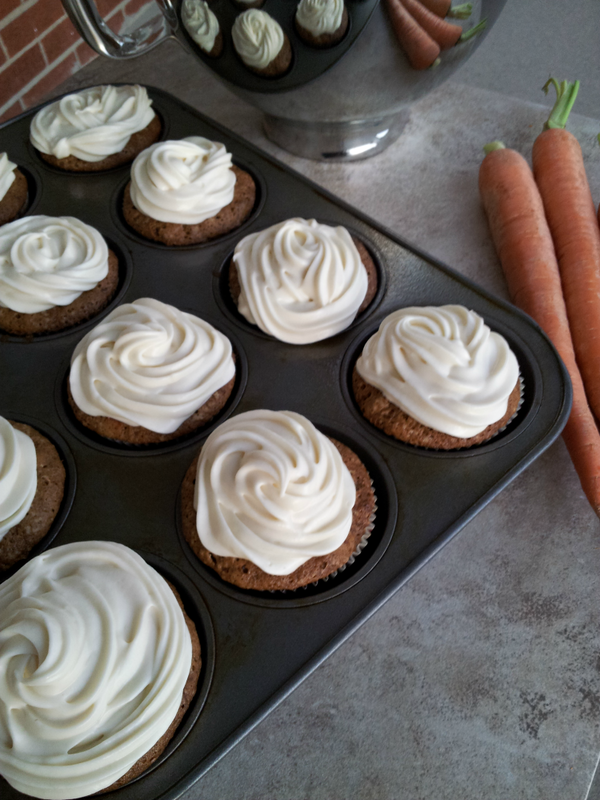 At the request of my man, here are some carrot cake cupcakes. PJ's birthday was this past weekend! I love celebrating his birthday all weekend long :) We ate out ALOT and enjoyed every bit of it. Gotta splurge sometimes, he deserves it. He wanted to go to Dave and Busters and so we drove out on Saturday night prepared for a crowd since it's the weekend, but definitely not prepared for how many people were there. I mean, who goes to Dave and Busters anymore? I hadn't been there in like 15 years lol and I never hear anyone saying they are going there for birthdays anymore. Wrong. Packed. Little kids running around everywhere. Lines to play all of the games. You know what I learned? I'm officially old. Back to the point. 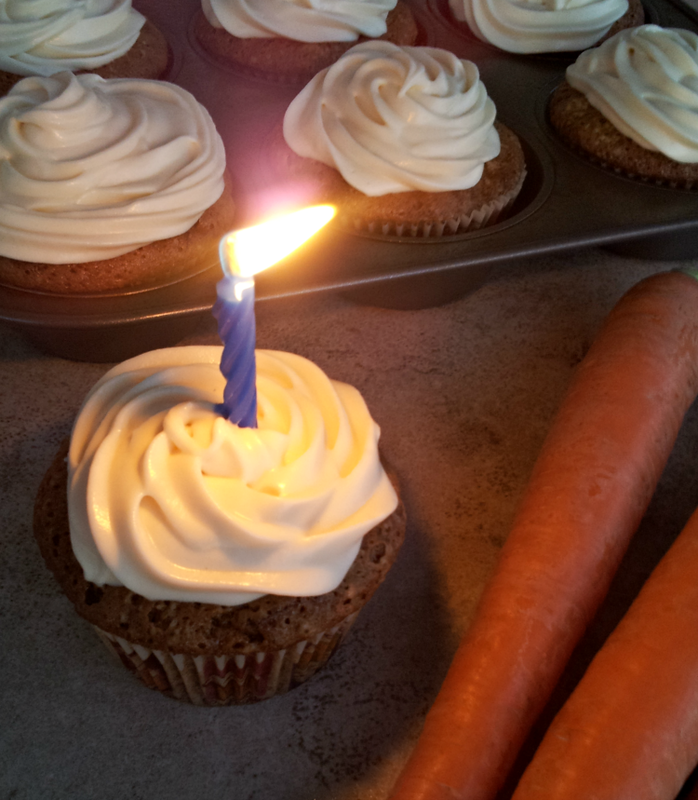 It was his birthday on Friday and so when I asked what kind of birthday cake he'd like, he said carrot cake cupcakes. Sounds good to me. Carrot cake is one of my fave cakes, and cupcakes are easier than cakes. And cuter. He wins, I win, we all win. *Note: You will have leftover frosting. Preheat oven to 350 degrees and line 12 muffin cups with paper liners. Spray the liners with baking spray. In a medium bowl, whisk together the flour, cinnamon, baking soda and salt. In a large bowl using an electric mixer, beat the eggs with the canola oil. Gradually beat in the sugar at medium-high speed and beat until thick, about 3 minutes. Beat in the vanilla. Fold in the dry ingredients with a rubber spatula, then fold in the carrots. Spoon the batter into the muffin cups and bake for 25 to 30 minutes, until a toothpick inserted in the center of the cupcakes comes out clean. 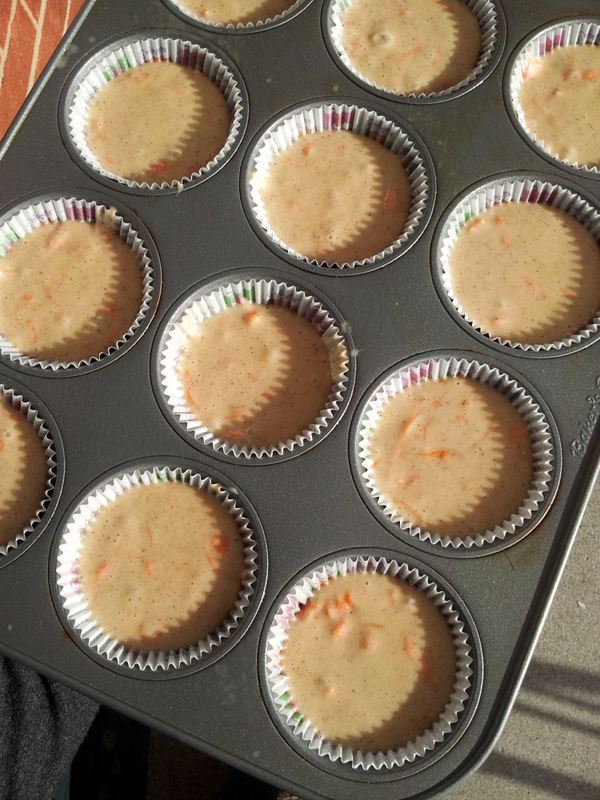 Let cool slightly, then transfer the cupcakes to the freezer to chill. Beat the cream cheese and butter on medium speed until well combined and smooth, about 2-3 minutes. Mix in the vanilla extract. Gradually beat in the confectioners sugar until totally incorporated. Increase the speed and then beat until smooth. Frost cooled cupcakes as desired. *I used a Wilton 1M tip. *NOTE: The frosted cupcakes can be refrigerated for up to 3 days. These cupcakes were fluffy, moist, perfect. The frosting was a tad too sweet so I reduced the confectioners sugar amount in the above recipe. These were for PJ but of course I couldn't keep my hands off of them. I've got leftover frosting and carrots in the fridge.... I think that means another batch coming right up. Happy happiest birthday to my best friend, my love, my fiance, the man I'm lucky to spend all my time with and who even after 14 years, is still my favoritest (yep, just made that a word) person of all time. Thanks for sharing all of your birthdays with me! And thanks for loving carrot cake like I do and for asking for carrot cake cupcakes which led me to find this recipe and discover the beauty that is this cupcake.